Artist Joshua Meyer is known for his thickly layered paintings of people, and for a searching, open-ended process. 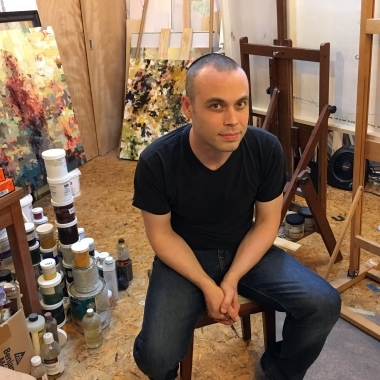 The Cambridge, Massachusetts, artist is the recipient of a Pollock-Krasner Foundation Grant as well as the Sustainable Arts Foundation Award, and a Painting Fellowship from the Massachusetts Cultural Council. He studied art at Yale University and The Bezalel Academy. The artist’s work has been shown in galleries and museums across the United States, Europe and Asia, including a solo exhibition, Tohu vaVohu at Hebrew College in Boston, and Becoming at the Yale Slifka Center and NYU Bronfman Center and the retrospective Seek My Face at UCLA’s Dortort Center. Joshua Meyer has been represented by Lyons Wier Gallery since 2017.